Um, what? 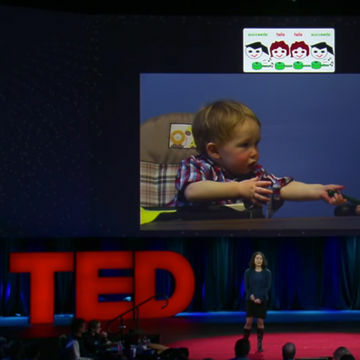 A nursing mother was asked to leave a TED conference that was supposed to be about empowering women. If you've ever listened to a TED Talk, you probably know how inspiring these presentations can be. There are some that can leave you breathless or with a renewed sense of purpose. At their best, the talks are inclusive and make members of marginalized groups feel like they can accomplish anything. But as wonderful as TED Talks can be, one woman felt less than welcome after attending the brand's conference in San Francisco. In fact, she was—literally—shut out of the event. Many attendees were familiar with TED's "grownups only" policy—under which children younger than 14 are not allowed to attend the events—but because Liza Morris was breastfeeding her child, she really had no choice but to bring her infant daughter along. She (understandably) thought this might be all right: After all, it was a TEDWomen event, and it's only natural to assume that this sort of gathering would accommodate the struggles real women face. Quartz reported that Morris was warmly welcomed by other attendees during the early parts of the event. They held doors for her, greeted her infant and helped her lug her diaper bag. But on the third day of the conference, the mother and her baby were reportedly escorted out of the event. “It’s never even occurred to me that I couldn’t take my baby. If I had been aware [of TED’s policy], I certainly would have tried to cancel. But I have to clarify that when I have a child at a venue, I will never let her disturb anyone,” Morris told Quartz. "When I was pregnant with my first child four years ago, I saw my friend take her one-year old baby [to a similar event]. Thinking back, it was quite an inspiration to me." It's true that TED did implement a no-baby policy, but we wonder why they weren't able to make an exception for this nursing mama—Morris was especially upset since there was reportedly a service dog in attendance. This isn't the first time a TED event has shut out nursing moms: Fellow nursing mom Jessica Jackley publicly complained that she was also asked to leave a seminar about the power of women because she was with her infant, who was being breastfed, at last year's event. Jackley followed that tweet up with one expressing her love for TED and TEDWomen, but lamenting the group's decision to ask attendees to leave their children if they choose to attend. Quartz also reported that TEDWomen's staff sent out an email detailing provisions that had been set up for breastfeeding mothers. Obviously, it's wonderful that they arranged things like lactation rooms, but when it comes right down to it, TED could be smarter about the ways in which they're supporting all women—and that includes nursing moms.